Los Angeles Kings center Jeff Carter shoots and scores past Chicago Blackhawks defenseman Johnny Oduya during the third period of Game 2 of the Western Conference finals in the Stanley Cup playoffs. In Wednesday night’s 6-2 loss to the Los Angeles Kings, the Chicago Blackhawks spent 46.2 minutes playing five on five against the Kings, scoring only one goal and taking only 18 shots. That’s well below the Blackhawks’ regular season pace of 2.73 goals and 32.6 shots per 60 minutes of five-on-five play (second best in the NHL). If you’re looking for a reason to be worried about the Blackhawks, start there. Through two games in the Western Conference finals, both of those figures are down more than 30 percent; the Blackhawks are getting just 1.90 goals and 22.1 shots on goal per 60 minutes of five-on-five play. That’s obviously a small sample size for Chicago, but no team averaged fewer than 25 shots per 60 in the regular season this year. Only the Buffalo Sabres and New Jersey Devils averaged fewer than 1.90 goals. Often when an offense flags, it’s because it can’t bring the puck into the offensive zone cleanly. Retaining possession as a team crosses the blue line leads to an average of more than twice as many shots, scoring chances and goals as when it dumps the puck in and chases after it. But that hasn’t been the Blackhawks’ problem. A blogger who covers each team (Nick Chapin of Jewels From the Crown and Jen Lute Costella of Second City Hockey) recorded zone entries and shared the data with me. There are two options when a player approaches the blue line with the puck: He can retain possession, or he can dump it in to try and beat the defender without it. Chapin’s and Costella’s data show that through two games, the Blackhawks carried the puck in 71 times and dumped it in just 57 times (excluding dump-ins that are just for the purpose of changing lines). That’s appreciably better than the league-wide average of about a 50:50 ratio. But once the puck is in the Kings’ zone, the Blackhawks are struggling to do something with it, especially when they dump it in. 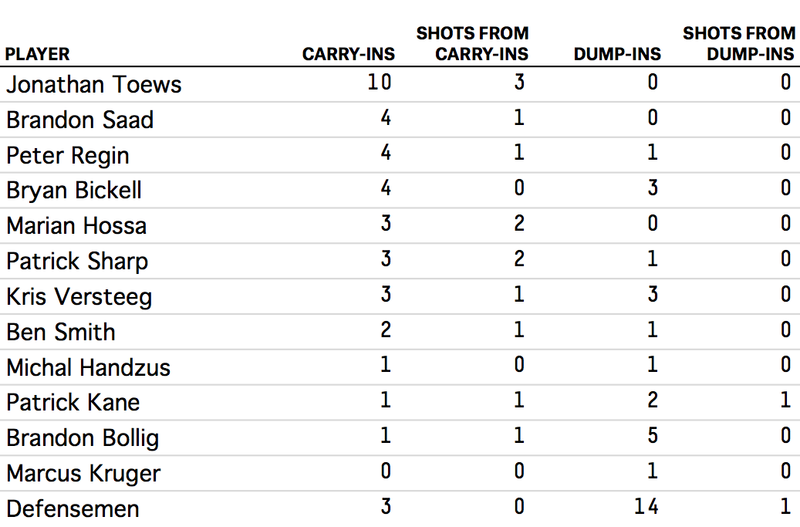 So far in this series, Chicago has managed to produce just three shots on goal from 57 dump-and-chase plays when it’s playing five on five, and two of those three were relatively harmless shots from the point. This is consistent with what the Kings have done in the regular season: They haven’t held the opponents’ carry-in rate particularly low, but they did significantly limit opponents’ shots per possession. If the Blackhawks are going to get their offense going, they’re either going to have to somehow find a way to carry the puck in on nearly every entry, or they’re going to have to get their forecheck going to generate some offense from their dump-ins. The series is tied 1-1; they get at least three more cracks at finding the answer.